Cindy McCain is a busy woman. She is Sen. John McCain's wife, and a businesswoman and humanitarian in her own right. Somehow she still makes time to be phenomenally good at Instagram. Though she has fewer than 5,000 followers at the moment, each of her posts is carefully curated to give her followers a peek into her interesting life. It's fabulously entertaining. We gleefully combed through all 243 weeks of her account to analyze just what makes McCain so skilled with her social media account. My mood waiting for my glorious little grandson to make his appearance. Any time now! McCain's Instagram is authentic. She loves to use wild filters on her photos, but her captions remain hilariously unfiltered. No professionals have their hands in this account. This is pure, unadulterated Cindy McCain. Not only does McCain love to post photos of her grandchildren -- she also shares relatable cartoon photos about her day. Bershire Hathaway meeting in Omaha. I LOVE my life!! Whether it's just cooking dinner or encountering the Wienermobile, McCain is jazzed about life. Think the 62 year old is too old for Snapchat? Nonsense! She loves to try out the newest filters. Plus whatever this is. Happy National Sandwich Day! My favorite is peanut butter and jelly! It doesn't matter if it's National Sandwich Day or National Doughnut Day or anything in between -- McCain has a stock photo to post for that. 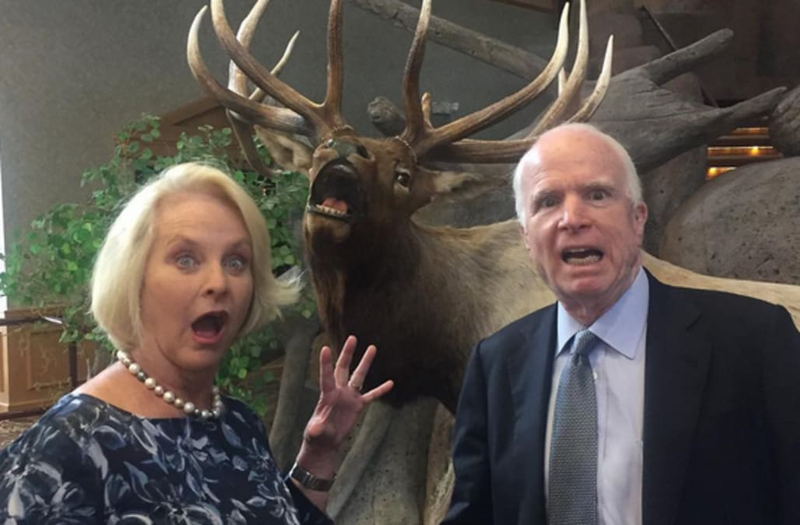 McCain brings out the playful side of her famous spouse with silly, casual pictures. With @senjohnmccain fending off a dangerous Thank you Pinetop, AZ. We're not sure if she's better at Instagram than Melania Trump is at Twitter, so we'll let you decide. Good morning. Nice hair huh! Beginning of some chili for tonight's debate. This is not me. But after the run I just made thru the Munich Airport I wished I'd has these. My dessert looks like Bob Costas eyes. A leak from up above! Yikes!! Bridget and John at lunch today. EXCLUSIVE: Inside the Victoria's Secret Fashion Show After Party -- Friendly exes, supermodel DJs and more!